Ninemia hotel complex of houses is located at the 7th kilometer of the main road that connects Karpenissi with Megalo Chorio. It is built in bright-green surroundings and it consists of five independent residences with different size and decoration. They all offer living room with fireplace, refrigerator, kitchen with dinner table and all the necessary facilities for a pleasant and comfortable stay. There are also five independent bungalows, of different size, with big verandas, separate entrance and fireplace, waiting for you to host. One of the suites has a Jacuzzi. All the area of 4,5 sq. meters is covered with grass and it is a very friendly space for children. It offers a playground, mini court 5x5, cycling track, bicycles and a lake with goldfishes. 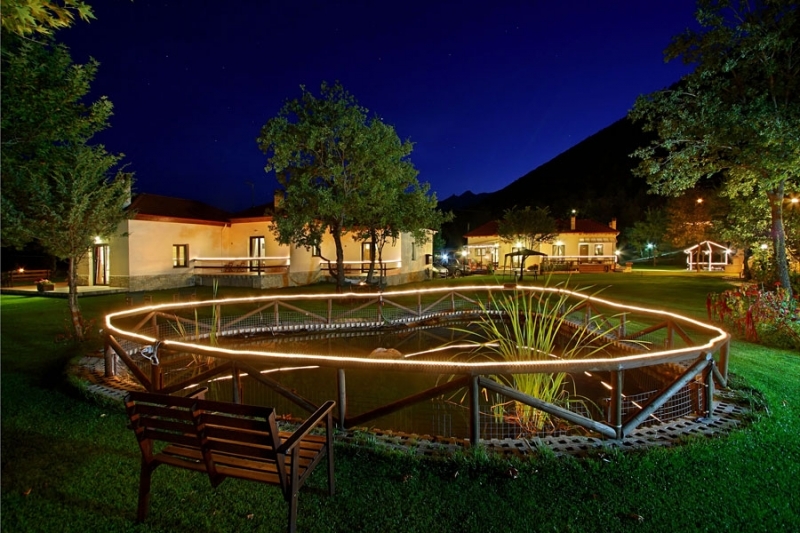 We want our complex to be a place of calm and relaxation like its name means Ninemia Resort. Some suggestions for the visitor are the excursions to the traditional made of stone villages, the rivers and the unique monasteries. Furthermore the ski center, and all winter sports as well as hiking, climbing and other sports like rafting, kayak, canoe, horse-back ridding, mountain cycling offer new opportunities for fun to the naturalists. Ninemia Bungalows Resort has 2 villas, 3 studio and 1 double room. 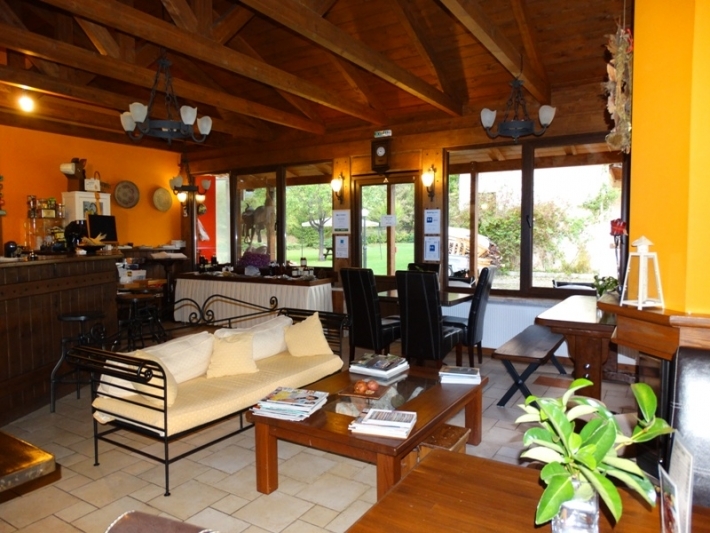 Ninemia Hotel offers a comfortable stay in Karpenissi area in Greece. The traditional and simple line of Ninemia Hotel in Karpenissi stands out among the rest traditional buildings of this beautiful area. 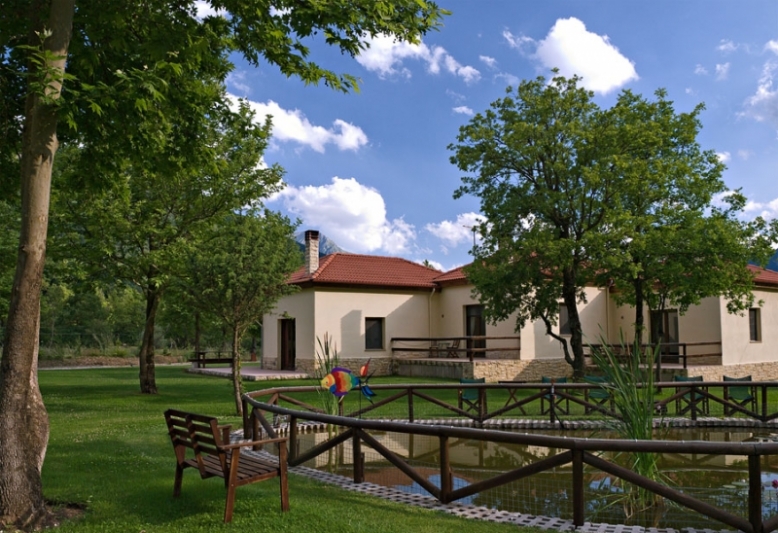 Ninemia hotel is located only 7 Kilometers away from the center of Karpenissi, next to the Karpenisiotis river, on the way to Proussos monastery allowing comfortable and fast movements. 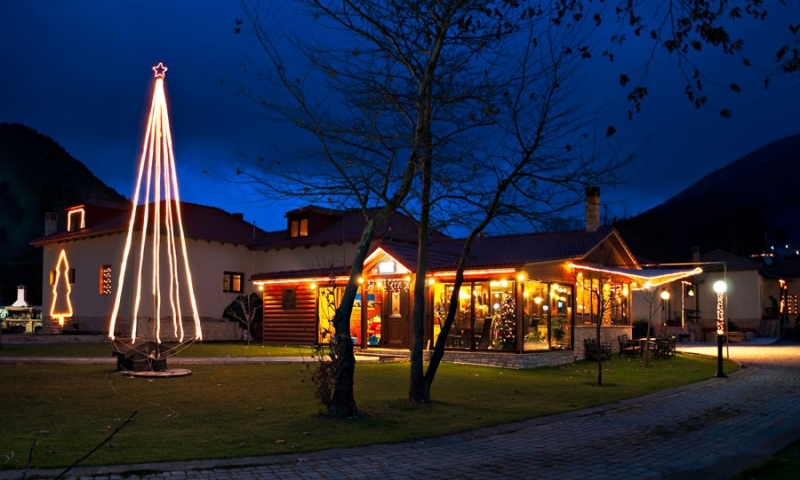 When arriving at Ninemia Hotel you feel the sense of hospitality of a traditional hotel in the country among other cheap hotels in Karpenissi. 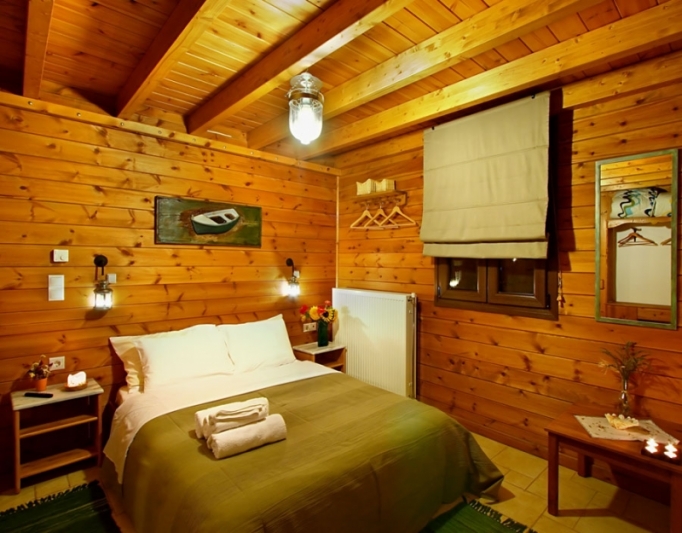 All rooms are spacious, comfortable and welcoming as well as fully equipped with all the comforts which will offer you an unforgettable stay in a country family hotel at Karpenissi in Greece mainland . If you are looking for a budget accommodation or a b and b in mainland Greece or a luxurious stay in a suite book now in one of the most hospitality hotels in Karpenisi and enjoy unique moments in beautiful central Greece! SAFE: Inside the closet of your room there is safe for storing valuables. HEATING: There is autonomus heating throughout. AMENITIES: In the bathroom of the room are a set of cosmetics. HAIR DRYER: All rooms have hair dryer next to the mirror. JACUZZI: You can relax in the Jacuzzi in some suites with Jacuzzi. KITCHEN: All accommodation types have fully equipped kitchen with refrigerator. BALCONY: The rooms have spacious terraces. DOUBLE BEDS: All rooms have double beds. BABY COTS:We offer babyCots for free. DVD: Some of the rooms have dvd . RECEPTION: At the entrance of the hotel. PARKING: The hotel has parking spaces for guests. 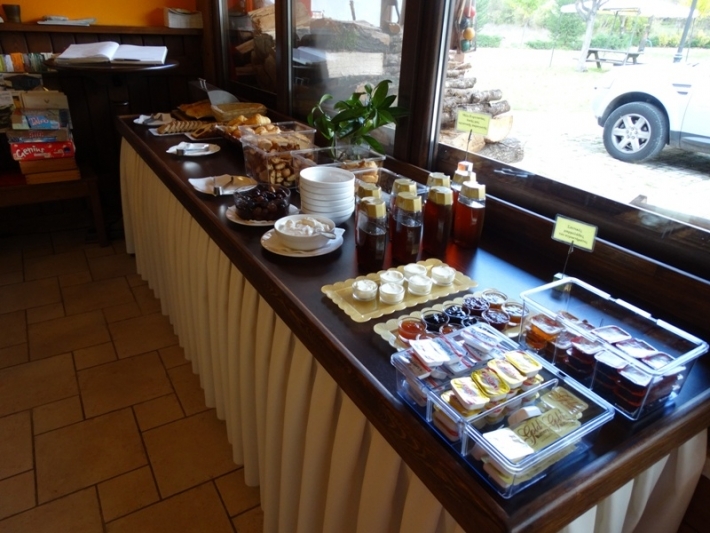 CAFE: The cafeteria of the hotel Ninemia hasa cozy cafe with handmade sweets and drinks. ARRIVAL: The time of arrival in the room is 13:00. DEPARTURE: The departure time from the room until 12:00. FLOWERS: You can order flowers obtainable at the Reception. INTERNET ACCESS: If you want to connect to the Internet from your room, the hotel has free wireless network in all areas. SATELLITE TELEVISION: Greek and foreign satellite channels you expect the receiver on your TV. PETS: Pets are allowed only on request. GARDEN: The complex Ninemia has all accommodation types surrounded by a garden. VIEW: All rooms have view of the lake and the Velouchi mountain. PLAYGROUND : 2 playgrounds for different ages are at the hotel Ninemia Karpenissi. BBQ: 2 different Barbecues are available for our customers. SPORTS FACILITIES: Volleyball court, Mini 5x5 football, ping-pong. BIKES: We have free bikes for all ages. BICYCLE TRAILS: Within 15 acres of estate there are trails for bikes. SAFE: Inside the closet of your room is safe for storing valuables. The area of Karpenisi, mountains and rivers, are ideal for many outdoor activities. Companies active in the area of alternative tourism, with experienced guides for all the above activities. 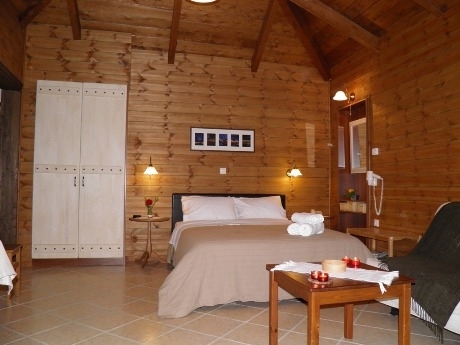 If you are looking for a budget accommodation or a b and b on greek mountains or a luxurious stay in a suite book now in one of the most hospitality hotel in Karpenhsi and enjoy unique moments in beautiful mainland Greece! The offer prices are not transferable and no offset. Rates include: VAT, linen, daily cleaning, wood for the fireplace, use of facilities of the estate (football, basketball, volleyball, ping - pong, bicycles, playground, indoor playground), learning and care animals. The offers are not valid during holidays and absences. Once informed by telephone about availability of accommodation, your booking is completed after prokatatavallete available to banks a deposit proportional to the amount of stay. Select one of the following bank accounts. Least 22 days before arrival date the deposit is refundable. Less than 21 days from the date of arrival, the deposit is not refundable. IN CASE OF DEPARTURE before the specified date, shall be paid 100% of days was not using the accommodation. In the case of no show you accept the charge of all the booking reservation amount. Our hotel has the right to claim the full amount of your booking if your card is canceled till the date of departure concerning the reservation dates if you have not accomplish thw payment in cash before your departure day.